Dr Billingsley is Professor of Mechatronic Engineering at the University of Southern Queensland, Australia. He is a Fellow of the IET (UK), past Fellow of Engineers Australia and as well as a Senior Member of the IEEE (USA). Professor Billingsley is Director of Technology Research at Australia’s National Centre for Engineering in Agriculture (NCEA). He has published widely on control theory in robotics. 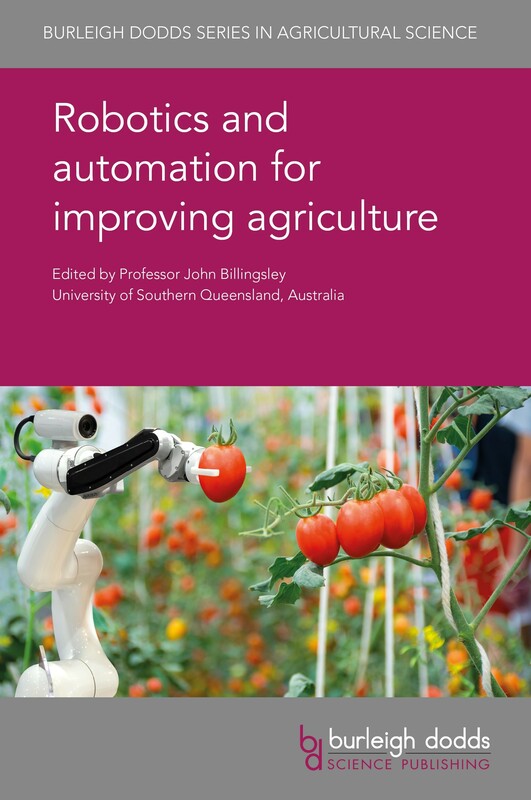 This book provides a comprehensive review of key advances in the use of robots in agriculture. Chapters summarise developments in location and guidance systems, GPS technologies, machine vision, navigation, actuation, communication and control technologies. The second part of the book discusses deploying these techniques to save labour, improve precision, speed and efficiency in agricultural operations. Chapters review the state of the art on the use of agricultural robots in planting, crop monitoring, spraying, irrigation and weed management. There are also reviews of orchard management and harvesting, harvesting of soft fruit and in-field grading of harvested produce. Other chapters cover the application of robotics in the livestock sector. "The challenges of robotics and automation dealt with in this book are pivotal to progressing this area of biosystems engineering and technology development in agriculture. In particular, the international range of expert knowledge in these chapters creates a key reference and a scientific basis for the systems-oriented and interdisciplinary approach we need in this area."